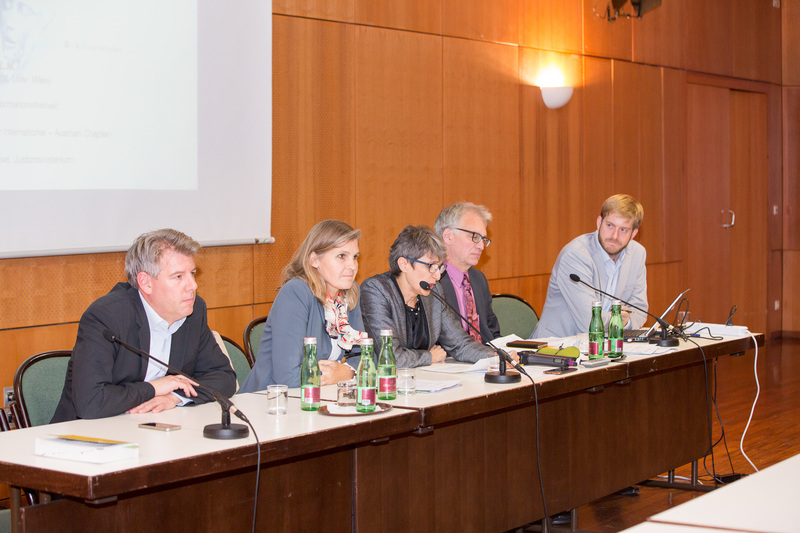 On September 27th, 2018, KNOETZL’s Bettina Knoetzl who, as the president of the Austrian Chapter of Transparency International, participated in a panel discussion on professional secrecy versus transparency. The discussion was hosted by the Austrian Institute for Criminal Law and Criminology (Österreichische Gesellschaft für Strafrecht und Kriminologie) at the Austrian Federal Ministry of the Interior. The audience, consisting of representatives from business, government and academia, was actively engaged and helped the panel to explore the issue in depth. In a democracy governed by the rule of law, decision-making processes and actions should be visible and understandable. Lack of information and opaque treatment of why certain decisions are made and specific actions are taken provide fertile ground for corruption. Austria stands in 16th place in the Corruption Perception Index (CPI) of Transparency International, which, the panel strongly believes to leave room for improvement, as countries with a ‘very clean’ status – such as several in the Nordic and Scandinavian regions – are routinely preferred by companies as business locations. The distinguished panel of speakers uniformly said that transparency lets public officials build trust with their constituents. When citizens are unaware, they are rendered incapable of exercising their democratic rights. From the viewpoint of Transparency International, transparency is a fundamental monitoring tool in any democracy – and critical in making Austria an attractive place to do businesses. However, the panel noted that transparency often reaches its limits when it confronts data protection, as transparency is often seen as being in direct conflict with the – also important – right of data privacy. Nonetheless, the speakers agreed, data protection should not be used as an excuse for the purpose of withholding what should properly be public information. Even the enforcement of data protection rights itself requires some degree of transparency. In order to ensure data privacy, comprehensive information requirements and disclosures are integral. The separation of powers with its critical checks and balances can only work if there is access to the information required to be monitored. Bettina Knoetzl advocates for data protection to become a tool of transparency: data protection can even out the balance and abuse of power. Information should be primarily public and transparent unless there are exceptional and warranted reasons to guard the data of civilians. Public administration needs to break with old traditions and build a thirst for transparency in the fight against corruption in politics, public administration and the media. Katharina Beclin from the University of Vienna served as moderator. If you have any questions about the topic of transparency, anti-corruption and bribery in Austria, please do not hesitate to contact Bettina Knoetzl or your customary relationship lawyer at KNOETZL.